All registrations will close on Monday, July 8 at 5pm. All paper registrations must be in to the Convocation Registration Committee by the same date. 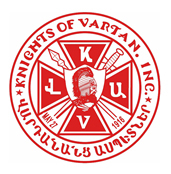 Registered Knights and Daughters only. Friday Night - "Kef Night Dinner Dance"
Ticket sales will open to the Armenian Community on June 1.
for paying by check and another that says Paypal. You don't need to have a Paypal account. You don't need to sign up for a Paypal account. You may use Mastercard or VISA. We use Paypal to process our credit card transactions. Why not round up your order with a donation.